The down of birds is a layer of fine feathers found under the tougher exterior feathers. Very young birds are clad only in down. Powder down is a specialized type of down found only in a few groups of birds. Down is a fine thermal insulator and padding, used in goods such as jackets, bedding (duvets), pillows and sleeping bags. The discovery of feathers trapped in ancient amber suggests that some species of dinosaur may have possessed down-like feathers. The word down comes from the Old Norse word dúnn, which had the same meaning as its modern equivalent. The down feather is considered to be the most "straightforward" of all feather types. It has a short or vestigial rachis (shaft), few barbs, and barbules that lack hooks. There are three types of down: natal down, body down and powder down. Natal down is the layer of down feathers that cover most birds at some point in their early development. Precocial nestlings are already covered with a layer of down when they hatch, while altricial nestlings develop their down layer within days or weeks of hatching. Megapode hatchlings are the sole exception; they are already covered with contour feathers when they hatch. Body down is a layer of small, fluffy feathers that lie underneath the outer contour feathers on a bird's body. Powder down, or pulviplumes, is a special type of down that occurs in a few groups of apparently unrelated birds. In some species, the tips of the barbules on powder down feathers disintegrate, forming fine particles of keratin, which appear as a powder, or "feather dust", among the feathers. These feathers grow continuously and are not molted. In other species, powder grains come from cells that surround the barbules of growing feathers. These specialized feathers are typically scattered among ordinary down feathers, though in some species, they occur in clusters. All parrots have powder down, with some species (including the mealy amazons) producing copious amounts. It is also found in tinamous and herons. The dust produced from powder down feathers is a known allergen in humans. Body down feathers, like these exposed on this adult male budgerigar's back, lie underneath the contour feathers and help to insulate birds against heat loss. For centuries, humans across the globe have used down feathers for insulation. Russian documents from the 1600s list "bird down" among the goods sold to Dutch merchants, and communities in northern Norway began protecting the nests of eider ducks as early as 1890. Eiders are still "farmed" by people in Iceland, Scandinavia and Siberia. The birds are provided with nest sites and protected from predators, and down is collected intermittently during the nesting season without harming the nests or female ducks. The first collection is made roughly halfway through the incubation period, when some 0.75 oz (21 g) of high quality down is removed per nest. When the eggs have hatched and the young have left the area, the remaining down and breast feathers are gathered, typically resulting in another 0.75 oz (21 g) of lower quality feathers per nest. In general, 50–60 nests will produce about one kilogram (2.2 pounds) of down feathers. This means that only a few thousand pounds of eider down is collected from wild nests each year. Approximately 70% of that harvest is from Iceland. 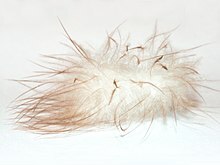 In the United States, Federal Trade Commission regulations require that any product labeled "100% Down" must contain only down feathers, while products labeled simply "Down" can contain a mixture of fiber and feathers. In addition, products labeled as "Goose Down" must contain at least 90% goose down, 10% goose feathers. Down insulation is rated by fill power, which is the number of cubic inches displaced by a given ounce of down (in3/oz). To measure fill power, an ounce of down is placed into a graduated cylinder, and a small weight is dropped in on top of it; the volume below the weight indicates the fill power. Eider down has the highest fill power, at 1200. However, even down with a fill power as low as 550 still provides reasonably good insulation. Higher fill-power downs will thus insulate better than lower fill-power downs of the same weight. Insulation in most outdoor equipment ranges from about 400 to 900 in3/oz (230–520 cm3/g). Down rated 500–650 in3/oz (290–375 cm3/g) is warm enough and light enough for most conditions, and 800–900 in3/oz (460–520 cm3/g) fill is used for very lightweight and/or very cold-weather gear. A portion of the world's supply of down feathers are plucked from live birds, a practice condemned as cruel by animal welfare groups. The precise percentage of down harvested in this manner is uncertain; while some references report that it is only a small fraction of the total (less than 1% in 2011), a 2009 Swedish documentary reported that it might be as much as 50–80% of the total supply, a figure supported by IKEA (a home furnishing chain) and an industry representative but disputed by organizations within the industry. The documentary also shows birds lying on the floor with large flesh wounds from the plucking, after which the wounds were stitched using a needle and thread without anesthetic. Although live-plucking is illegal in Canada, the United States and Europe, it is known to occur in two European countries (Poland and Hungary) and in China. Public sentiment against the practice has, in some countries, been strong. IKEA and Patagonia (a clothing manufacturer) have altered product lines to eliminate the use (or possible use) of live-plucked down. Feathers found in amber in western France, Canada and northeastern China suggest that some non-avian dinosaurs may have had primitive, down-like feathers. Eider down: This is considered to be the ultimate in duck down; it is collected from the breast feathers of the female eider duck and has the largest duck down clusters. Polish/Hungarian goose down: Widely considered to be the finest quality down clusters, they are larger than the norm and are mostly pure white in color. Feather-down combinations: Down compacts with age and is not appropriate for some applications; most down-filled pillow forms are stuffed with a combination of down and feathers. The presence of feathers adds weight, stability and bulk. Therefore, a mixture with more down will be lighter and fluffier than a pillow with a higher feather ratio. Marabou(t): Marabou (historically spelled with a T) is down from the marabou stork although turkey down is used as a substitute. It is widely used as a fashion trimming and in fly tying. ^ "7down (noun)". Merriam-Webster Dictionary. Retrieved 2009-05-29. ^ Spearman, Richard Ian Campbell (1973). The Integumen: A Textbook of Skin Biology. Cambridge University Press. p. 97. ISBN 978-0-521-20048-6. ^ Podulka, Sandy; Rohrbaugh, Ronald W.; Bonney, Rick, eds. (2003). Home Study Course in Bird Biology, second edition. Cornell Laboratory of Ornithology. p. 55 (Glossary). ^ Juniper, Tony; Parr, Mike (2003). Parrots: A Guide to the Parrots of the World. London: Christopher Helm. p. 17. ISBN 978-0713669336. ^ Kalstone, Shirlee (2006). Allergic to Pets? : The Breakthrough Guide to Living with the Animals You Love. New York, NY: Bantam Dell. pp. 34–35. ISBN 978-0-553-38367-6. ^ a b Scott, Graham (2010). Essential Ornithology. Oxford University Press. p. 31. ISBN 978-0-19-856997-8. ^ Carboneras, Carles (1992). "Family Anatidae (Ducks, Geese and Swans)". Handbook of Birds of the World, Volume 1: Ostrich to Ducks. Barcelona, Spain: Lynx Edicions. p. 558. ISBN 978-84-87334-10-8. ^ Hilton, Geoff M.; Hansell, Mike H.; Ruxton, Graeme D.; Reid, Jane M.; Monaghan, Pat (July 2004). "Using Artificial Nests to Test Importance of Nesting material and Nest Shelter for Incubation Energetics". The Auk. 121 (3): 777–787. doi:10.1642/0004-8038(2004)121[0777:UANTTI]2.0.CO;2. ISSN 0004-8038. ^ Kreisinger, J.; Albrecht, T. (October 2008). "Nest protection in mallards Anas platyrhynchos: untangling the role of crypsis and parental behaviour". Functional Ecology. 22 (5): 872–879. doi:10.1111/j.1365-2435.2008.01445.x. ^ Burger, Joanna; Gochfeld, Michael; Jeituer, Christian; Snigaroff, Daniel; Snigaroff, Ronald; Stamm, Timothy; Volz, Conrad (2008). "Assessment of metals in down feathers of female common eiders and their eggs from the Aleutians: arsenic, cadmium, chromium, lead, manganese, mercury and selenium" (PDF). Environmental Monitoring and Assessment. 143 (1–3): 247–256. doi:10.1007/s10661-007-9973-y. PMC 4300135. PMID 17934788. ^ Crawford, R. D. (1990). Poultry breeding and genetics. Amsterdam: Elsevier Health Sciences. p. 182. ISBN 978-0-444-88557-9. ^ Grinnell, George Bird (2008). The Indians of Today. Read Books. pp. 74–75. ISBN 978-1-4437-6970-9. ^ Mooney, James (1973). The Ghost Dance Religion and Wounded Knee. Mineola, NY: Courier Dover Publications. p. 919. ISBN 978-0-486-26759-3. ^ Hodge, Gene Meany (1993). Kachina Tales from the Indian Pueblos. Santa Fe: Sunstone Press. p. 57. ISBN 978-0-86534-184-5. ^ a b c Johnsgard, Paul A. (1999). Earth, Water and Sky: A Naturalist's Stories and Sketches. Austin, TX: University of Texas Press. pp. 119–120. ISBN 978-0-292-74059-4. ^ a b Roth, Harald H.; Merz, Günter (1997). Wildlife Resources: A Global Account of Economic Use. Berlin: Springer-Verlag. p. 363. ISBN 978-3-540-61357-2. ^ a b c Randall, Glenn (2000). The Outward Bound Staying Warm in the Outdoors Handbook. New York, NY: Lyons Press. p. 63. ISBN 978-1-58574-089-5. ^ Croiser, Susan (3 November 2017). "Collecting Eiderdown in a (Polar) Bear Market". Hakai Magazine. Retrieved 3 November 2017. ^ Wilks, Brian B. (2004). Browsing Science Research at the Federal Level in Canada: History, Research. Toronto, ON: University of Toronto Press. p. 210. ISBN 978-0-8020-8811-6. ^ Jenkins, Mark (December 1995). "From Bird to Bag". Backpacker. 23 (146): 68–72. ^ Getchell, Dave; Gorman, Steve (March 1994). "Sleeping Beauties". Backpacker. 22 (130): 103–123. ^ Cooper, Donald C. (2005). Fundamentals of Search and Rescue. Sudbury, MA: Jones and Bartlett Learning. p. 89. ISBN 978-0-7637-4807-4. ^ Kilpiö, K.; Mäkinen-Kiljunen, S.; Haahtela, T.; Hannuksela, M (February 1998). "Allergy to Feathers". Allergy. 53 (2): 159–164. doi:10.1111/j.1398-9995.1998.tb03864.x. PMID 9534914. ^ a b Hanson, Thor (2011). Feathers: The Evolution of a Natural Miracle. New York, NY: Basic Books. p. 288. ISBN 978-0-465-02013-3. ^ a b Villalobos, Alice. "Down With Live-Plucked Down". Veterinary Practice News. Retrieved 17 October 2011. ^ "China down industry disputes Swedish reports -- china.org.cn". www.china.org.cn. Retrieved 3 April 2018. ^ Media.pdf. "Plucking.pdf" (PDF). www.idfl.com. ^ Media. "Information.pdf" (PDF). www.idfl.com. ^ "TE Responds to PETA Allegations". responsibledown.org. Retrieved 3 April 2018. ^ "Down on the Goose and Duck Farm". Retrieved 10 August 2012. ^ Stuijt, Adriana (17 February 2009). "Ikea drops live-plucked Chinese down bedding from shops". Retrieved 17 October 2011. ^ "Lowdown on Down". Patagonia. 4 April 2011. Retrieved 17 October 2011. ^ Owen, James (11 May 2009). "Dino-Era Feathers Found Encased in Amber". National Geographic News. Retrieved 29 May 2009. ^ "Dinosaur feathers found in Alberta amber". CBC News. 15 September 2011. ^ a b Von Tobel, Jackie. "Bedding Basics: Types of Pillows." The Design Directory of Bedding. Layton, UT: Gibbs Smith, 2009. 52-53. Print. ^ "Eiderdown." Merriam-Webster.com. Merriam-Webster, n.d. Web. 10 Nov. 2013. <http://www.merriam-webster.com/dictionary/eiderdown>. ^ Hellekson, Terry (2005). Fish flies : the encyclopedia of the fly tier's art (1st ed.). Salt Lake City: Gibbs Smith. p. 91. ISBN 9781586856922. Campbell, Bruce; Lack, Elizabeth, eds. (1985). A Dictionary of Birds. Carlton, England: T and A D Poyser. ISBN 978-0-85661-039-4. Wikimedia Commons has media related to Down (feathers). This page was last edited on 7 February 2019, at 14:25 (UTC).